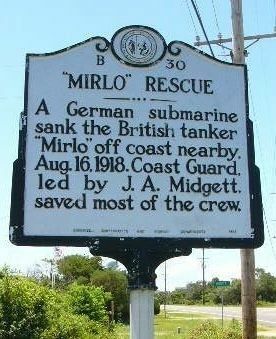 A German submarine sank the British tanker "Mirlo" off coast nearby, Aug. 16, 1918. Coast Guard, led by J. A. Midgett, saved most of the crew. Location. 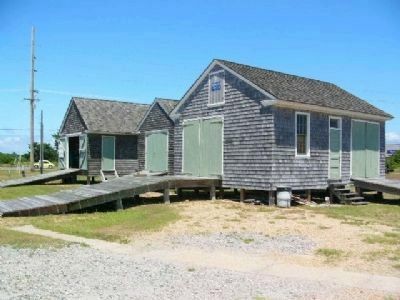 35° 35.734′ N, 75° 28.051′ W. Marker is in Rodanthe, North Carolina, in Dare County. Marker is at the intersection of State Highway 12 and Myrna Peters Road, on the left when traveling south on State Highway 12. Touch for map. 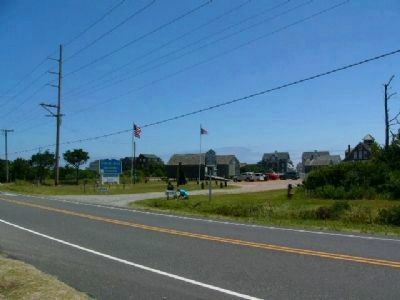 Marker is at or near this postal address: 23645 NC Highway 12, Nags Head NC 27959, United States of America. Touch for directions. (approx. 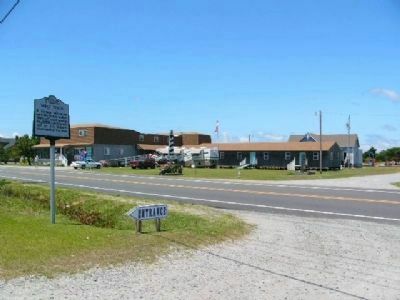 8½ miles away); Pea Island Lifesavers (approx. 8½ miles away); Giant Bluefin Tuna (approx. 14.6 miles away). Touch for a list and map of all markers in Rodanthe. More. Search the internet for "Mirlo" Rescue. Credits. This page was last revised on June 16, 2016. This page originally submitted on September 12, 2008, by M. L. 'Mitch' Gambrell of Taylors, South Carolina. This page has been viewed 1,075 times since then and 14 times this year. Photos: 1, 2, 3, 4, 5. submitted on July 1, 2009, by Kevin W. of Stafford, Virginia. • Kevin W. was the editor who published this page.